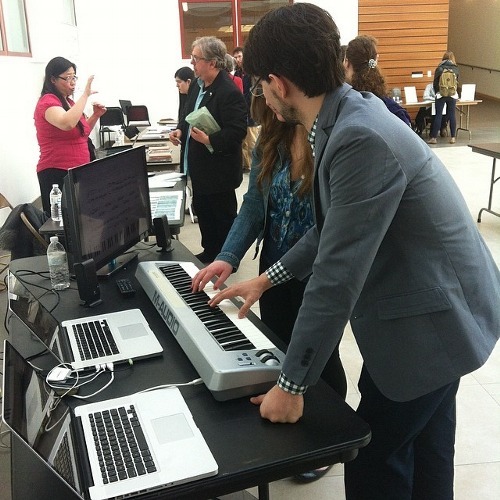 Last week we had the opportunity to host an open house at Queen’s College, alma mater of our Associate Music Director, David Gracia (seen demonstrating Playground in the image). Among the presenters there were 20 other companies such as Boosey & Hawkes, New York Foundation for the Arts, Chamber Music America, Opera America, and Lincoln Center. We were the only tech company there and we definitely created a buzz with students, staff and faculty! They all seemed very impressed not only by the advanced technology of our software but also by the potential applications of our platform in an academic setting. It is very encouraging to see the reception and high expectations that Playground raises as we are bringing our software to more schools and colleges, and it is becoming more clear to us the important role we are playing in the advancement of music education. This event was a blast for us to be a part of and we look forward to the many more in our future!